As I said in the last posting, the major pitfall of the plot driven writer is thinly developed characters. This pitfall is, however, symptomatic of a greater challenge, one which arises out of the natural inclination of the plot driven writer to begin a story with plot and story arc. 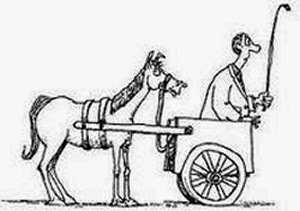 To do this, he calls in linear thought and critical thinking, which puts the cart before the horse. The creative process finds is origins in images and feelings, both of which are decidedly non-linear. The first stage of the process is often quite chaotic. Anything is possible. Linear thought, however, seeks patterns and solutions. Its movement is toward order and completion, both of which are integral to the development of any creative endeavor, but not at the beginning. In my experience, asking the plot driven writer to start the process from other than his home base can bring on writer's block. The more staunchly analytical the writer, the more destructive this can be. For such writers, the plot twists and action are the driving forces of the story. What characters feel and think may not even enter the mind of a plot driven writer. For them, characters are there to support the plot, when just the opposite is true. Does this mean that the creative process is unfairly harsh on the plot driven writer? Or that the plot driven writer is doomed to starving his characters? Absolutely not! As I said in an earlier posting on this blog, I know many a character driven writer who are green with envy at writers who find plotting easy and fun! What is the plot driven writer to do? I believe that a writer should never try to change how she instinctively approaches the writing process on first or even second drafts. Begin writing what is easiest and most fun for you. If that means plotting and planning and outlining, then do it! Your mind will never give you peace until you do. However, do it with the understanding that there is nothing sacred about the plot and outline you first devise. Once the outline is finished, at best only sketched out, it’s time to let go of plot and fall into character. This isn’t as easy as it seems. The mind that loves to organize and control doesn't readily fall in the messiness of character and the chaos of the unknown. In the next postings, I will explore ways for the plot driven writer to overcome these challenges and quiet the mind's need to be in charge. For now, I suggest you go back to the beginning of this series and explore the pitfalls of the character driven writer, because they apply to you, too! Interesting in learning to open to and develop great characters and plots?